For suppliers of quality flooring and carpets in Ashton under Lyne, Out & About Carpets offer a customer-focussed buying experience with our “choose at home” services. Quality Laminate, Vinyl Flooring and Carpets in Ashton-under-Lyne – from Greater Manchester’s most unique Flooring Company. Quality assured Carpets in Ashton-under-Lyne – with samples brought to your home. Choose from leading brands at affordable prices – without the pushy sales experience of the typical showroom. For quality vinyl flooring in Ashton-under-Lyne, we have a wide range of styles to bring to your home. This is one of the most family-friendly floorings out there and we can save you time and money. Looking for laminate flooring in Ashton-under-Lyne? Out & About can bring the perfect selection to your home. Find out more about this incredibly stylish flooring option. Be inspired by some of our recent carpet clients from Ashton-under-Lyne and across Greater Manchester. Be inspired by quality vinyl flooring that we have supplied and fitted in Ashton-under-Lyne and across Greater Manchester. 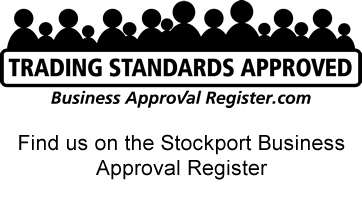 Because we are approved by Stockport Trading Standards Business Register, our Unique “choose at home” service is hugely popular – and the good news is we cover Ashton-under-Lyne too! If you are looking for flooring or carpets in Ashton-under-Lyne we hope we are the sort of company you would trust to work with. Why choosing Out & About for your flooring and carpets in Ashton-under-Lyne saves you time & money! You could sit in traffic and waste your weekends at the local retail part – or you could shop for your flooring a different way – the Out & About way. Firstly, because we come to you we can bring a huge portfolio of quality carpets, vinyls and laminate flooring samples to choose from – that you can immediately match to your decor. Looking for carpets in Ashton-under-Lyne? Laminate or vinyl flooring? We want to hear from you.